Second baseman Jason Kipnis signs an autograph for a fan at 2013 Cleveland Indians Tribe Fest. 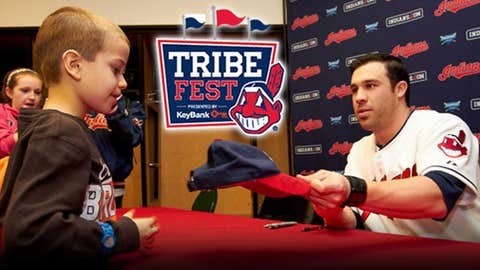 Cleveland, OH — The Cleveland Indians announced on Friday that All-Star second baseman Jason Kipnis and newly signed relief pitcher John Axford have been added to the player lineup for this year’s Tribe Fest, presented by KeyBank, set for Progressive Field on January 25 and 26. 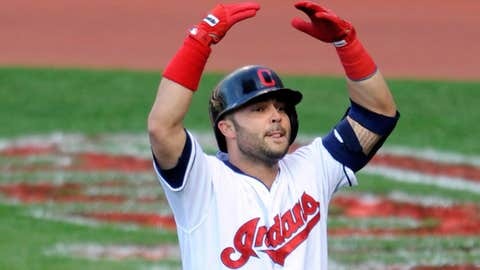 Kipnis, who made his first All-Star team in 2013, and Axford, who was signed by the Indians in December, join manager Terry Francona, Nick Swisher, Michael Bourn, Michael Brantley, Mike Aviles, Carlos Santana, Danny Salazar, Yan Gomes, Corey Kluber, Zach McAllister, David Murphy, Trevor Bauer and other current roster players scheduled to appear at the event. The lineup also will include Indians prospects Tyler Naquin and 2013 top pick Clint Frazier, and several prominent Tribe alumni including Kenny Lofton. Players, prospects and alumni will sign autographs, take part in interviews on the KeyBank main stage and more. In addition, more of Progressive Field will be open this year, including the 1994 Party Suite for autographs, Club Lounge, Kids Clubhouse and more. The Indians also plan to announce their 2014 promotions schedule on the KeyBank main stage during Saturday morning’s session. Join the ‘All Bets Are Off’ crew as they broadcast LIVE from Tribe Fest on Saturday, January 25 at 12:00pm. Admission for adults is $10 in advance and tickets are available NOW at Indians.com/TribeFest. Kids ages 12 and under again this year can attend the event for FREE when reserved with the purchase of an adult ticket. There is a limit of two free children’s admissions per paying adult. Tickets for kids age 12 and under are $5 at the gate day of event. Each Tribe Fest event features multiple autograph sessions, for which 250 tickets will be sold. Autographs for specific players are not guaranteed, just a space in line. If autograph sessions are not sold out, fans will be allowed to wait in line at their own risk for autographs, time permitting and on a first-come, first-serve basis. In addition to interacting with players, young fans can hit in the Progressive Field batting cages (waivers will be required), take tours of the home clubhouse, listen to Q&As with Tribe broadcasters and players, and more. Concessions will be available in the Club Lounge, while KeyBank customers will have access through pre-event registration to an exclusive area in the Collection Auto Club at Progressive Field. All player appearances are subject to change. For complete event details, visit Indians.com/TribeFest.